My Monday Washington Examiner column continues my look at what the Republican National Committee is doing to reform the presidential nominating process. My first take on the subject from last week is here. 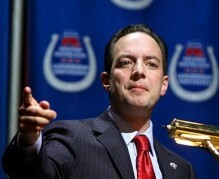 My most recent conversation with RNC Chair Reince Preibus on the subject is transcribed here. The GOP cannot handicap itself going into the next three years just because “that’s the way it has always been done.” Neither can it be hostage to the bogus RINO-hunters who see in every change an effort to keep Tea Party activists at bay or big donors happy. Continue reading this post from HughHewitt.com here.